CWT (832) 413-6431 fabricates and installs the best rain chimney caps in Houston. Largest selection of choices in Texas made from stainless steel, copper, colored metal, or galvanized. CWT has chase covers, flat top chimney caps, hip roof chimney caps, and decorative chimney caps to meet you budget. Less expensive or crazy decorative, every chimney cap does the same function to terminate the chimney top and keep out water. An advantage to CWT chimney caps is that all of our chimney caps Houston keep out animals from entering the chimney. Chimney caps need to be made to function for the lifetime of the chimney. Any chimney cap that just sits on the top of the flue does not prevent water damage and deterioration of the masonry joints. A chimney cap should be covering the entire top of the chimney. The original builder of the house is not required to put a chimney cap on a masonry flue fireplace. The damper is considered the valve closing the chimney allowing the chimney open all the way down to the damper. Water and animals can pour in and cause damage. If purchasing a new or old home make sure a full coverage chimney cap is installed. CWT makes its chimney caps from 24 gauge thick metal. This is strong enough to handle Texas winds, rain, and an animal invasion attempt. Lifetime warranties are given with a CWT technician installation. We do not offer a lifetime guarantee without CWT installing because an improperly installed chimney cap will come off. 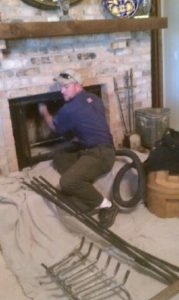 Chimney caps Houston are best installed by the best chimney service, CWT.